Grand prize: RM10,000 Cash & UR winning design + UR name will be featured on mug promotion nationwide. Buy any Campbell's Instant Soup products as Proof of Purchase. Creatively design your mug using the available tools. When you're done, submit your design. A caption describing the mug design in no more than 10 words. The caption must be written in English language only. 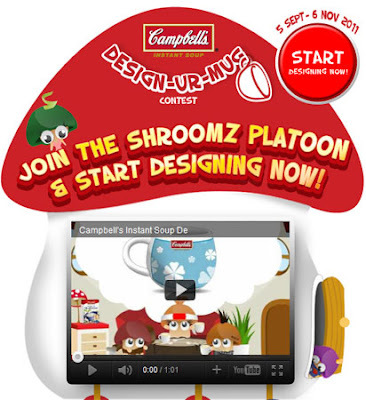 Visit Campbell's Soupies Facebook fan page for more detail.